Plan administrators sometimes are confronted with claims that appear untimely, but nevertheless focus solely on the substantive issue raised by the claim. A recent ruling from a federal district court in New Jersey suggests that the failure to address procedural issues may result in a finding that such defenses have been waived. In Becknell v. Severance Pay Plan of Johnson & Johnson, 2014 U.S. Dist. LEXIS 54684 (D.N.J. Apr. 21, 2014), plaintiff Alan Becknell submitted a claim for severance benefits in 2012. The plan denied his claim on substantive grounds. The denial letter stated nothing about the timeliness of the claim notwithstanding the fact that it had been filed more than four years after Becknell’s last date of employment and the plan provided that all claims for severance benefits must be filed within 180 days after a qualifying event (e.g., last date of employment). After Becknell filed suit, the plan moved to dismiss, arguing for the first time that the claim was untimely under the terms of the plan. Observing that “district courts should not rely on a plan administrator’s post hoc rationales for denying claims when it failed to provide those reasons during the administrative hearing,” the court determined that plan had waived its untimeliness defense and thus denied the plan’s motion to dismiss. 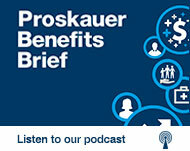 Proskauer’s Perspective: Plan fiduciaries charged with adjudicating administrative claims and appeals should consider whether it is appropriate to raise not only all substantive reasons for denying a claim and appeal, but also all procedural defenses.